'Wörrumbi' shields are noted for their distinctive ridge or 'mesha' (spine). This forms a central axis for pecked, incised and painted forms that symmetrically cover the surface. The designs are believed to represent anthropomorphic figures and they are typically coloured with red ochre and white mineral pigment traded in from the west. 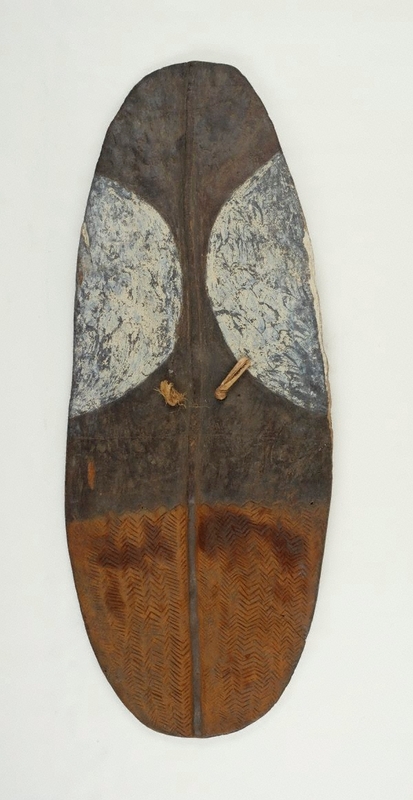 This shield also has two small holes at the top to which bird plumes were secured.